More seasoned users will find it a nominal upgrade, but for the uninitiated Tracktion 4 is well worth a spin. Rack Filters concept. Genuinely different approach to DAWs. Reasonable price (for new buyers). Despite the marketing, this is a point upgrade not a significant overhaul. 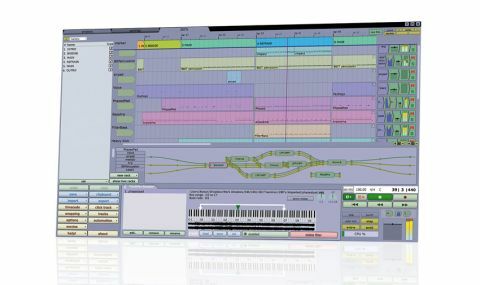 Before it fell off the radar about five years ago, Tracktion was lauded as a hugely innovative, keenly priced and supremely intuitive DAW that looked like it was really starting to find its feet (see our Tracktion 3 review). "Tracktion is now back under the ownership of its inventor, the renowned audio developer Julian Storer"
Tracktion is now back under the ownership of its inventor, the renowned audio developer Julian Storer, along with his two ex-Mackie partners. While we understand their desire to get Tracktion back in the public eye as quickly and effectively as possible, Tracktion Software aren't really fooling anyone with press releases describing compatibliity with modern operating systems (which, along with WASAPI, AU and 64-bit support, is really all that's been added) as a "significant upgrade". What we really have here is essentially a relaunch of Tracktion 3, and an update that we absolutely believe should be made free for Tracktion 3 users - if we were being generous, we'd call this Tracktion 3.5. However, it's still a superb piece of software at a very reasonable price, so while we may not approve of the PR and marketing tactics, we are certainly glad to see this powerful one-window DAW back on the scene. You may well be looking at the screenshot at this point, wondering what we've been smoking, and yes, we'd agree that Tracktion's not exactly what you'd call pretty. However, its one-window interface is a joy to work with, once you get used to it, and the power and flexibility of the Rack Filters concept at the heart of the software is endlessly impressive. If you thought Live's Device Racks were cool, Tracktion's modular sound design environment will blow you away. Although what we're really waiting for is v5, Tracktion stacks up surprisingly well in 2013, despite the feature set beyond the UI and Rack Filters being obviously rather behind the times. While Tracktion 3 users have every right to feel a bit miffed at being stung for 30 bucks just to get up to speed with current standards, if you've never tried Tracktion, we'd strongly urge you to do so - it utilises a very different functional paradigm to anything else on the market, and for that reason, you might just find yourself falling in love with it.